[ FULL HD 1080P & WIDE ANGLE CAMERA ] - Simultaneous recording in Full HD 1080P for front view video recording and 480P waterproof rear cam, 170 degree wide angle lens for front camera and 120 degree for rear view camera, providing excellent coverage and ensuring you get the very best footage possible all day. [ WIDE AND CLEAR 7-Inch IPS TOUCHSCREEN ] - The 7" touchscreen is pretty responsive, beautiful. The display for settings, video recording, photo taking and playback are on the mirror itself which is touch sensitive. It fits comfortably over your existing rearview mirror, doesn't occupy the interior space, and still maintains the function of the rearview mirror. [ AUTO DIMMING ] - Thanks to the Light Sensor Chip, Chyu Dash Cam support automatically adjusts the brightness. According to different light intensity. (Including harsh light, low light, dark night.) The adjustable brightness is for viewing your rear view. When cars behind you reflect their lights into your rear view mirror too harsh, the auto dimming will not let the light become a distraction for drivers. 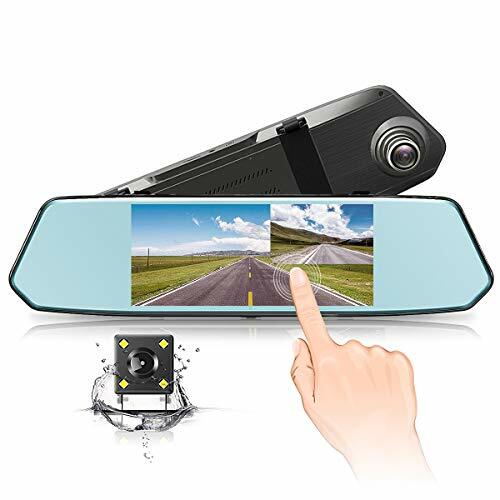 [ REVERSING CAMERA KIT FOR SAFE PARKING ] - The rear view cam support switch to the full screen HD reversing image, no need to turn around and easy to park with the help of guidelines. [ What's Include ] - 7-Inch Dash Camera, 4M Car Charger, Rear Camera, 6M cable for rear camera, Dash Camera Mounting Buckle, User Manual. 45-Day Money Back Guarantee and 12-Month Warranty. Since the insurance cost keeps climbing up, a dash cam becomes very necessary. If the HD video proof could work for you even just one time, you could save much more money than the price of this dash cam.